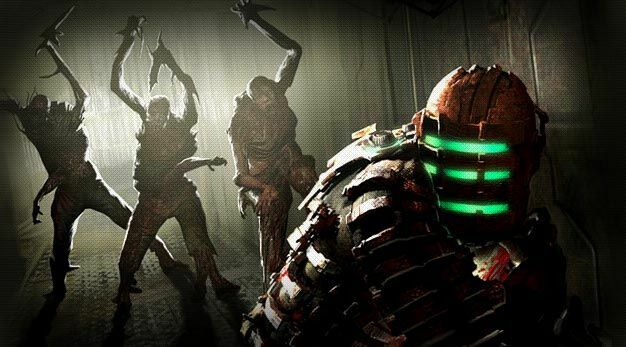 Dead Space is one of those games that has had a lot of praise over the years since its release, I have played through Dead Space a countless number of times and I have formed what I believe is a fair opinion on this apparent gaming masterpiece. Many fans of the series love the games because of the countless gory ways that the protagonist can die, but in my opinion gory visuals are not needed to make a game good, so I’m going to look at every thing else and I will form my opinion from all the aspects I believe are often forgotten. You take control of this unfortunate fellow Mr Isaac Clark, Isaac is the Engineer of the ISG Ishumura which is a specially Engineered ship which is carrying a team of explorers across multiple planets to find resources which are needed to help earth survive after an unforeseen event which caused the planet to almost go extinct, after successfully stripping multiple planets of their resources, unfortunately the ISG Ishumura eventually ends up crash landing on a mysterious planet and this is where the game begins. 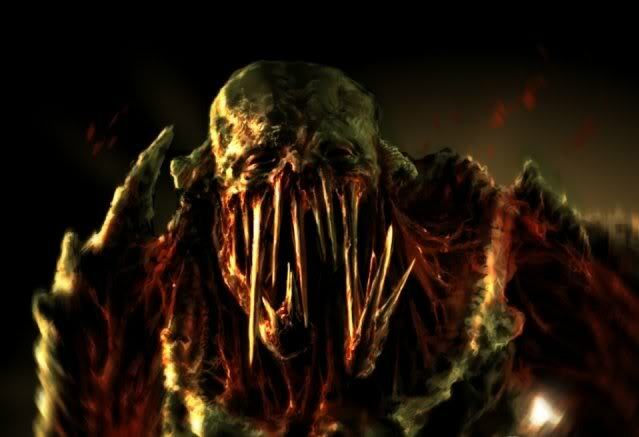 As soon as the game play starts Isaac and his crew are almost immediately attacked by a very strange race of creatures called Necromorph’s, these creatures kill the majority of the crew and those who survive are separated from Isaac leaving him to fend for himself. 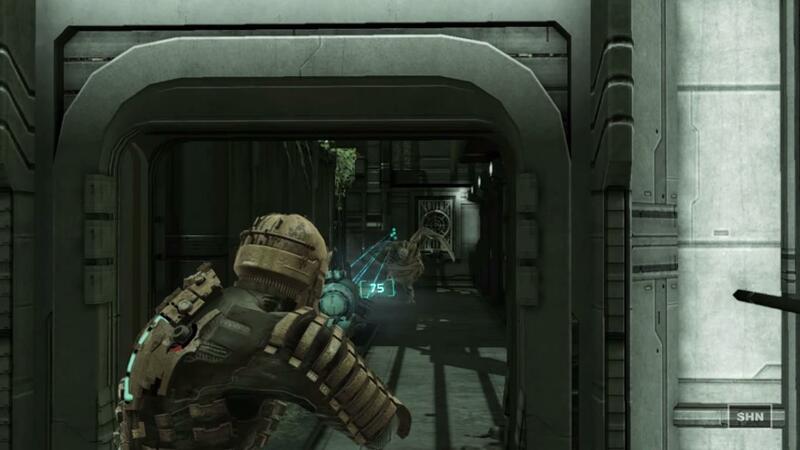 The Necromorph’s themselves definitely add a unique combat style to the game, instead of plowing enemies full of lead like most shooters, Dead Space has the player needing to shoot the enemies in the limbs instead of the head or the chest, this may not seem too special but it does add a whole new feel to the general FPS experience. 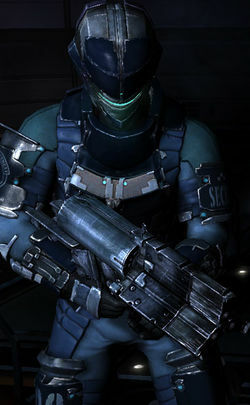 Of course shooting all of these aliens is going to need some serious fire power, luckily Dead Space is not shy on weapons as throughout the game Isaac will find many weapons which he can use to shoot, beat and decapitate aliens all day long. Some of my favorite weapons include the Plasma Cutter which is a powerful single shot weapon, its essentially shoots hot lasers and once it’s fully upgraded it can cut through limbs so quickly that it could make a Jedi jealous. My next favorite weapon is the Pulse Rifle, this military grade machine gun will tear through your enemies like there is no tomorrow . and finally the Ripper shoots sharp metal blades at your enemies and of course this can cause a lot of damage, a lot of Dead Space players don’t like this weapon as it can be quite complicated to use as you need to curve your shots in order to have maximum damage, but trust me when you get the hang of using it the ripper will be an excellent addition to your arsenal. 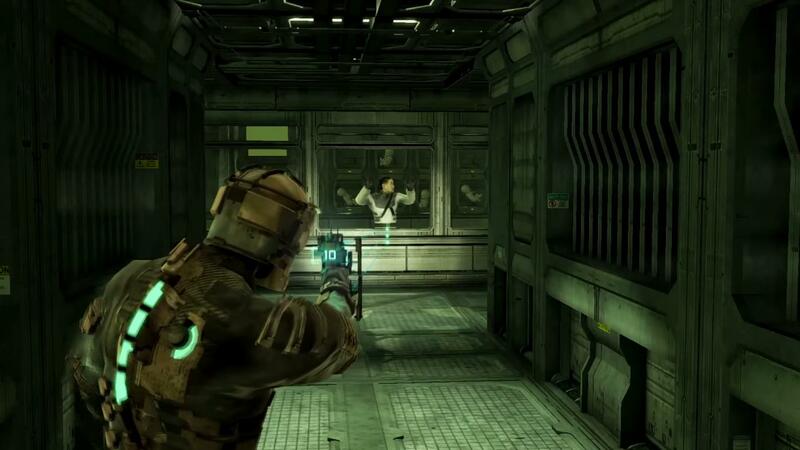 Other interesting elements to Dead Space are the many different scenarios and puzzles that the game throws at you. When your not collecting resources and trying to escape the ship, Isaac will at times need to deal with Zero Gravity areas, having to temporarily step outside the ship and into the empty atmosphere that surrounds him and this draining his oxygen every second he is outside and finally using his Kinesis Module to pick up heavy objects and to slow down certain aspects of the game. 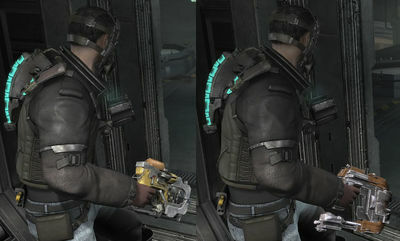 The graphics in Dead Space are for the most part very impressive, the aliens look great, the environments are very well detailed, the finer details such as blood splatter and shadows are very well done but the human characters look like they came out of a top quality PS2 game which is very disappointing considering that everything else is up to par with a PS3/360 game, its sort of like making a really healthy salad of bell peppers, tomatoes and lettuce and then covering it with bacon and syrup, its not a massive problem but the addition of the bacon and syrup can make a very healthy salad a little off putting. Dead Space doesn’t have a lot of music but I believe that this benefits the games style and feel greatly, Dead Space is a survival horror which relies on the player listening to the environments in order to avoid being killed by sneaky Necromorph’s, a lot of games rely of music as it helps build up the feel of the game play and helps avoid boring the players, so the fact that Dead Space can keep the player so tense and immersed with such a limited soundtrack is very impressive. 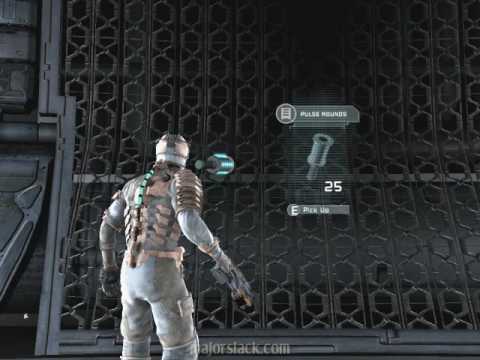 Dead Space is one of the most immersive experiences I have had with a video game in a very long time, it really kept me on my toes and it often had me panicking and genuinely feeling uncomfortable which is the best results that a survival horror can give, the graphics are amazing apart from the graphics of the in game AI’s and the lack of music really helps intensify the game play, Dead Space is also one of the goriest games I have played in a long time, the game isn’t too graphic when the player is just blasting enemies but when you die a death cut scene will play showing the gory nature of how you died in great detail, the controls are absolutely perfect and the game runs at a smooth 60 FPS so if you die only you are to blame, the story is really interesting and it only gets more and more crazy in every installment of the series, one of the main aspects to the story is trying to find Isaac’s missing wife who contacts Isaac as a hologram throughout the game. 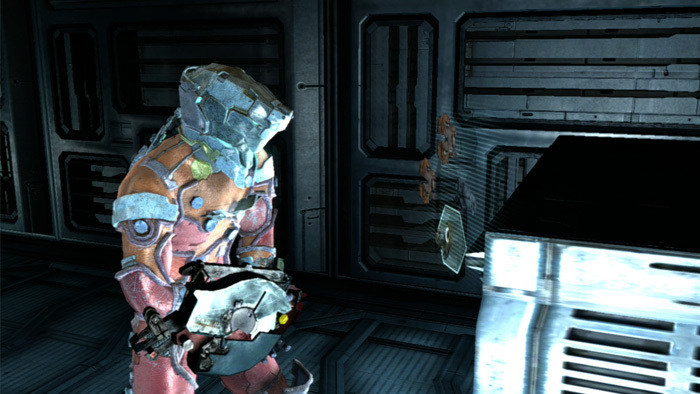 Will he find her in Dead Space 1? you will have to play to find out.